RPS paid $2,050 to repaint these spaces and install the four signs. Good idea? Of course. Required by the ADA? Certainly. Reasonably priced? Not unless you’re in favor of throwing away public money. 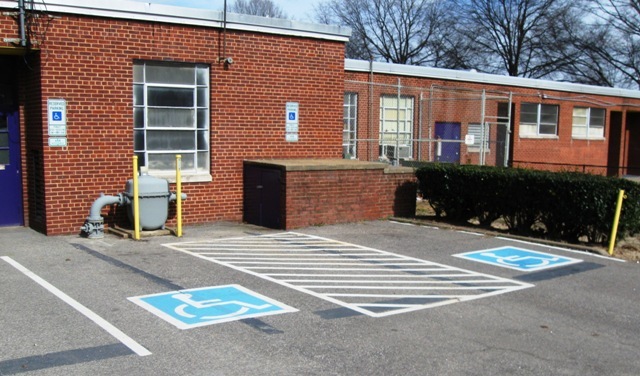 The Means ADA Compliance Pricing Guide estimates that painting a pair of disabled parking spaces should cost about $42. That’s based on quantity 100, so there will be some premium for painting only two spaces. You can get the four signs for $75.40 (see here and here). Two hundred bucks might be reasonable for these two spaces; ten times that is outrageous. Note added on April 25: Carol Wolf points out that the VA Office of Construction and Facilities Management publishes Cost Guides for use to estimate construction costs for planning purposes. According to their guide, surface parking in Richmond as of 2009 should cost about $2,506 per space to construct. That's grading, paving, and painting. Yet here we have RPS paying $1,025 per space for repainting. Then we have the design. RPS paid $2,764 for this design. That’s right: The design for painting over the old stripes and painting a pair of conventional disabled parking spaces cost more than the work. Note added on May 2&3, 2010: On April 13, Felicia Cosby, RPS' Public Information Officer, wrote Chris Dovi regarding the payment of architects to design handicap parking signs: "Handicap parking spaces: RPS has not paid for a 'redesign' of parking signs, but a design of the parking lots." Design of parking lots, eh? A FOIA request quickly demonstrated that one is a whopper. 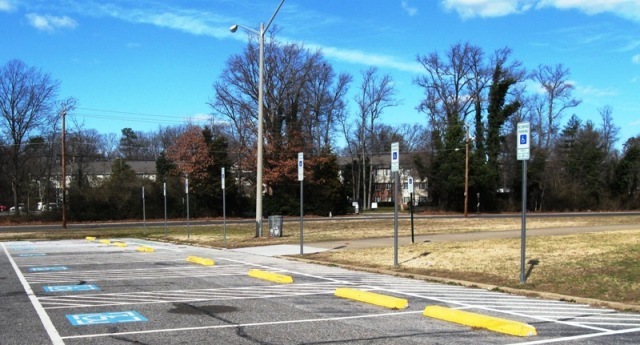 To return to a simple example, I asked RPS for all the parking lot designs at Westover Hills. They sent another copy of the very large (ca. 36x48") drawing for the two spaces. I can't reproduce the whole thing here, but I can show you the pieces: the vicinity & location plan; the removal plan; the new work plan; the enlarged version of that plan; the notes, the signature box for the architect; and the signature box for the engineer. Indeed, the Notes say: "There has been no analysis of features outside the immediate area of improvements . . ." So much for a "design of the parking lot." So, not only is RPS squandering money here, they are telling telling whoppers about it. See below for more on this subject. Yet, if there is a car or van in the left hand space here, a wheelchair in the aisle will have to go around that vehicle. The “accessible route” runs through the gas pressure regulator. In contrast, here are the (likewise pricey) new spaces at Wythe; notice how the aisles connect to a clear route in front of the parking spaces. Indeed the plan (portion reproduced here (pdf)) does not even show the gas pressure regulator or that brick structure sticking out from the wall (see the photo above). It shows the spaces running up to the wall and the signs on the wall right at the ends of the spaces. It seems this pricey, inadequate design comes from somebody who did not look at the place, or even at a photo. Indeed two somebodys, at least: The plans carry the name of both the architectural firm and an engineering firm (and the stamp of an engineer). Apparently this elaborate project required the expertise of an engineer who, apparently, also didn't look at even a photo of the location for this expensive design. Note added on May 2&3, 2010: Cosby's email continues: "[T]here are several factors that have to be considered in the design, including traffic patterns, grading, the condition of the concrete, access hazards, etc." There is no evidence of traffic patterns, grading, the condition of the pavement, or access hazards on the Westover Hills drawings. Just one drawing showing the paint over the old lines and two drawings showing how to paint in the new, inadequate lines in a place that does not exist. And the note says "Proposed improvements have been designed to comply with [cited standards] in the immediate area of the improvements only. There has been no analysis of features outside the immediate area of improvements . . ." So much for a "design of the parking lot." So, expensive, inadequate parking spots and and a nice lie. Where the marked-up hourly rate for any classification exceeds $125.00 per hour for an A/E Project Manager / Coordinator, or exceeds $100.00 per hour for other technical classifications, documentation justifying the higher rate must be approved by the Agency Contracting Officer / Chief Facilities Officer and that documentation of that approval included in the record of the negotiations. At $125/hour, the maximum the State will pay without raising a fuss, the design of those (lousy, expensive) parking spaces at Westover Hills would take 22.1 hours. (The design of the better ones at Wythe would take 22.4 hours at the $125 rate.) Imagine that: Three days to draw two, conventional disabled parking spaces. Perhaps they take extra time to get it wrong. Data here are from the RPS spreadsheet. (1) Note that the total design cost for these parking projects is 39.1% of the total construction cost. You have to wonder whether these expensive architects are somebody's brother-in-law. More on this subject here and here and here. Related information on RPS's violation of state procurement law and unlawful racial preference here. (1) Jonathan Mallard asked RPS for the spreadsheet itself, rather than the PDF posted on the RPS Web site (it's hard to run totals on a PDF). RPS replied that they did not have the Excel spreadsheets (presumably held by their construction manager). Mallard then pointed out that RPS already had lost on that stupid theory when I sued them for documents they tried to conceal by giving them to their lawyer.